IN ARSENE THEY TRUST? Arsenal fans may bay for his blood, but they are stuck with Arsene Wenger. The guy brings the test of patience to life. Even when he has clearly failed to show results, Wenger will not willingly offer the job to someone else. If your girlfriend is always patient with you, she is either an Arsenal fan or she genuinely just loves you for who you are. If she is an Arsenal fan, she has learnt a rare virtue of patience from the club she supports with adoration. She is hopeful for tomorrow. She believes that you will one day walk her down the aisle just like you promised (Hmmm dreamers!). She has stuck by you through thick and thin. You claim to play kawoowo (flair), look attractive but run away from any situation that requires you to spend. Your wallet is drilled with staples but she is still patient. She cries that you do not leave money at home but somehow sticks around. She grows tired of you but for some strange reason won’t ditch you. That is the kind of torturous relationship Arsenal fans have been subjected to with their manager Arsene Wenger for the longest time. The name Wenger brings a bad taste to any Arsenal fan’s mouth. They want him out as soon as yesterday, but the dude is hanging on. Yes, hanging onto a trail of disappointing seasons and trophyless spells. You wanna be like Le Professeur, here is your idle man’s guide. Arsene Wenger is the poster boy of all stingy guys around the world. He holds his wallet close to his chest. While his fans have called out on him to break the bank with some new players, dude chooses to sign some random casual labourers from the streets of France. He has learnt all the laws of diminishing returns in Economics and other principles in Economics to avoid spending. The dude simply won’t spend. To be like Wenger, say no to spending. Prices in restaurants or malls should give you the creeps. One scientist Isaac Newton once said, “Teka Sente Wolaba”, meaning that put money only where you will find value. These girls who come to restaurants to eat things whose names they cannot pronounce should never see anything that comes out of your wallet. The only thing stingy guys can buy in this world is time. They buy more time for themselves when things are tight. On the other hand, spendthrifts swim in debt and zibs. You feel nothing but pity for the man when you see him on the touchline. Dude looks clueless. He will wipe his face so many times as if trying to erase the pain but nara. Instead of going to play with his grandchildren, the old man is rather comfortable watching Giroud miss chances on pitch and Ozil standing on the pitch like a taxi tout. The pressure is inexplicable but he still chooses to turn up for work and disappoint the Arsenal faithful one more time. That is his motivation. The “Wenger-Out” calls have fallen on deaf ears time and again. Wenger is going nowhere. 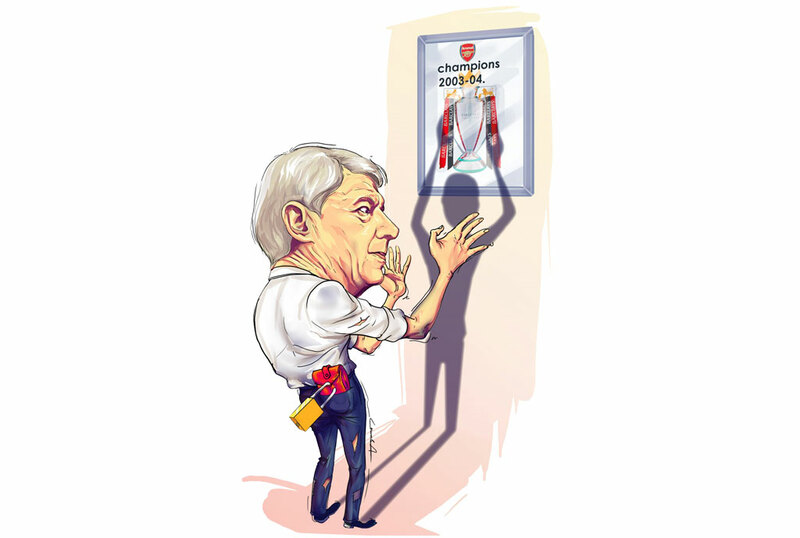 If you want to be like Wenger, be the person who will hang onto a business that has failed but still hangs on, probably to organise a pre-requiem mass or funeral for it. Keep doing the same things and expect different results. Promise your loved ones change yet you are the change that needs to happen for everyone to be happy. Retirement is not up for discussion. Arsene Wenger lives on past glory of like a million years ago. His team last won a league title in the Stone Age era and is still banking on that success now. You know how you buy a chick a blouse on her birthday and you expect her to look as enticing in it 10 years later? That’s the Wenger logic. It’s basically expecting a Nokia 3330 phone of back in the day to give you a snapchat experience. Unrealistic. To be like Wenger, remind people of what you did for them back in time. If it’s a gift you bought them, mark an anniversary of the purchase date. They cannot take your generosity for granted. Anytime they start acting funny, bring out those receipts to show them how much you have sacrificed for them. Dwell in the past but we all know how sad that life can be. To be like Wenger, remind people of what you did for them back in time. If it’s a gift you bought them, mark an anniversary of the purchase date… anytime they start acting funny, bring out those receipts to show them how much you have sacrificed for them.